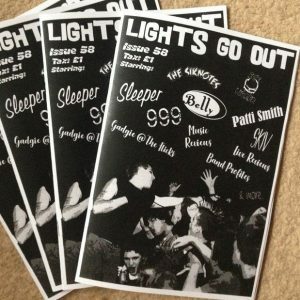 Thanks to everyone who has picked up the latest issue of Lights Go Out. We’ve just done one of those stock check things and there are just 2 copies left of issue 58! And we’re in single figures for issues 55, 56 and 57. So if you do fancy picking up a copy, please grab one quickly. Issue 59 will be out in a couple of weeks and issue 60 is planned for Mid to end September as well. More news on these coming soon, but we can confirm that issue 60 will definitely feature Audio Karate.